It's shocking how only a few days after you drive home with your new used car, these warranty "companies" for lack of a better word, start sending you a cluster of mailings usually as post cards and urgent scare tactic immediate response letters. They often send you 3 or 4 of them disguised differently from the same entity, often using different names and phone numbers and P.O. boxes, all urgent in nature. 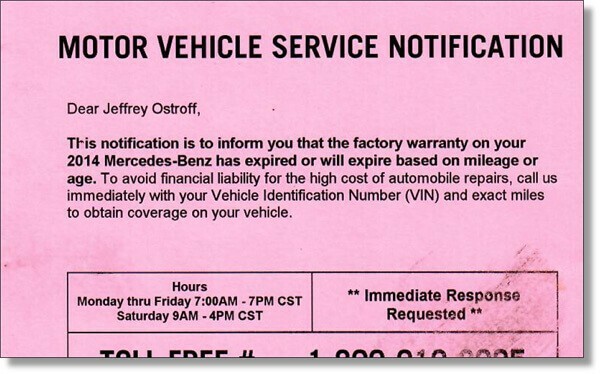 They are trying to appear at first glance to be affiliated with the manufacturer or the dealer, warning you that your warranty is about to expire. Here we are going to show you real world examples of actual warranty solicitation letters and post cards we have received after buying a used Mercedes E-Class, and you'll see firsthand why we have been warning consumers for 20 years to avoid most of these mailings and postcard solicitations you receive to sell you an extended warranty for your car. Where are these warranty companies getting my personal information from so quickly? 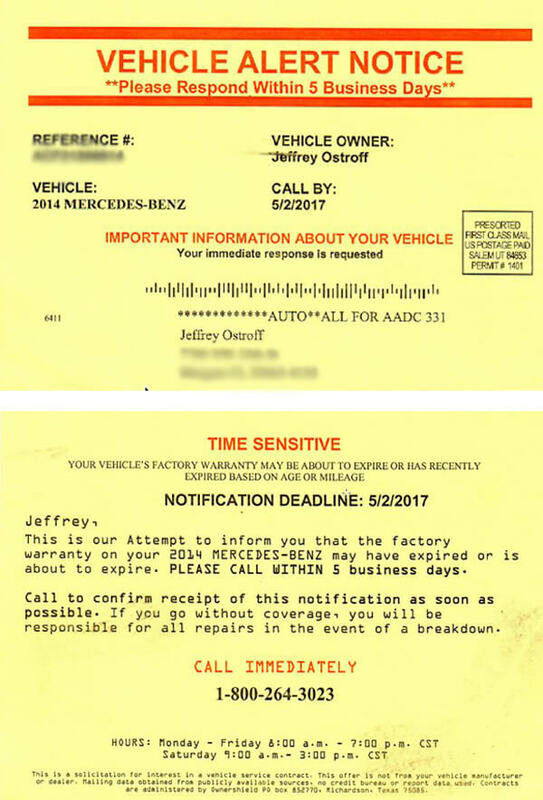 I was wondering myself, just how am I receiving letters just days after I bought my used Mercedes from our local Lexus dealer? We don't know if these companies are buying mailing lists from the state after an application is made for registration and title, or if it is from the car dealer who sold you the car, or if it is from 3rd party back end IT and CRM services used by car dealers who are selling your data to add to their profit of selling their services to the car dealer. There are a lot of people handling your private information when you buy a car. Many of these companies have misleading business practices, no established web site, often using a dizzying array of smoke and mirrors with different confusing names, and numerous mailings with a confusing brand soup of names that shields you from who is really behind it all. Let's get you quickly up to speed with the big picture. There really is no such thing as an extended warranty from a legal standpoint, unless it is offered by the manufacturer. All other 3rd party offerings after the sale of the vehicle cannot be legally referred to as warranties; they are legally called Vehicle Service Contracts. This is because only the manufacturer can sell you a warranty for their own product. 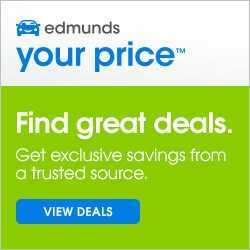 Although you and I and even many salespeople loosely call it an extended warranty, these really are just service contracts, where the "warranty company" agrees to perform service on your car if it is a covered repair according to the contract that you buy. It is that simple, and whatever repairs are not covered by the contract will be denied for coverage by the vehicle service provider/warranty company. Enter now the many states here in the U.S. who have decided that these warranties are actually insurance products and they want them to maintain well-funded claims reserve accounts backed by or administered and insured by insurance companies and in some states you must actually be an insurance agency in order to sell extended warranties. All of these extra levels of complexity and funding requirements serve to protect you and I from underfunded and fly by night firms at risk of taking off with the money or going belly up leaving us with no warranty. Bottom line if your warranty company does not maintain adequate reserves to cover claims and if they fail to insure these reserve funds, and fail to re-insure the insurance backing these claims reserve accounts, they will fail guaranteed. We have seen it happen many times since 2000 to some major Internet failures like Warranty Gold, WarrantyByNet, the now-infamous US Fidelis fraud, and 1Source Auto Warranty. Many states also govern and license warranty companies and so it is actually illegal for most warranties to be sold in strict states like California and Florida unless they are licensed and the rules are so strict it keeps many at risk companies from selling there legally. Here in Florida, the companies who want to sell in this state must be registered and licensed with the Florida Department of Financial Services, under control of the Florida Chief Financial Officer. There may be similar requirements in your state. You should be able to look up a company's license to confirm they are legally licensed in your state to do business. If you can't find them in the database, do not buy a warranty from them. This will come in handy in our examples below. Example #1: Solicitation letter we got from company called Department of Warranty Services in Richmond, VA. I got 2 different but similar looking green letters from this company, each with different official looking seals with different company names with a detailed table of useless information with N/A all over it. Some copy cat scam companies have TBD written on every cell of the table. See a scan of one of the letters below. Their sales scheme letter is a one page description of nothing, which mimics the same basic form and layout of all the other companies sending out similar letters. It's basically the blind following the blind with the same joke of a cover letter offering no useful information other than urgent warnings and immediate response requested and oh yes, a toll free number to call. Each warranty sales letter this company sent me had different phone numbers to call, one was 877-324-0916 and the other was 877-262-5157. Companies most likely pull from a queue of phone numbers they control or change their phone numbers frequently. Sometimes I wonder if it is so that that if you Google them, you are unlikely to find any smoking guns because the number is too fresh, and has not yet established a pattern of complaints. So searching that company's phone numbers above produced zero search results of any indication who they are, it's like they are a ghost, something you would not expect for an established and well-funded company who has been around for at least one 5 year warranty cycle. You should be surprised that the company address is a P.O. Box and not an actual physical address of an office building with a suite where they might be located. The address they printed on the letter above was PO Box 85073 Richmond, VA 23285. So you Google that and you'll start to see a few complaints. 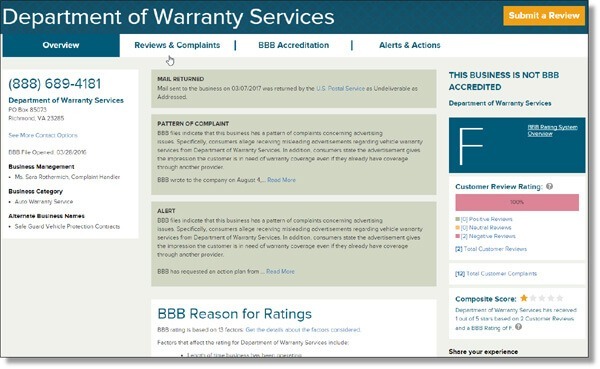 Search the Better Business Bureau for complaints against "Department of Warranty Services"
After searching the Better Business Bureau (BBB) we hit the jackpot and find a company known as Department of Warranty Services with the same P.O. Box I spoke of above, and it has an F-Rating with the BBB. Is this a company you want to be involved with or buy a vehicle service agreement from? I'll let you decide that. One important detail they left off of the mailer was their Florida license number to sell here in Florida so right off the bat I suspected they might be skirting the law and trying to sell without a license. I checked the Florida Department of Financial Services database with all iterations of the company name and could not find any evidence they are legally allowed to sell in Florida. Until someone can prove to me otherwise, I will assume this company is not legally allowed to sell in Florida. Also, unlike many of the other "companies" in this warranty letter mailing space, this company failed to mention in the teeny tiny barely readable fine print at the bottom of the letter that they are not related to the DMV or the manufacturer. You see, since many of these types of letters are misleading, they typically have to warn you at the bottom that they are not affiliated with the DMV or manufacturer. They wouldn't need these disclaimers anyway if their letters weren't so misleading to begin with. 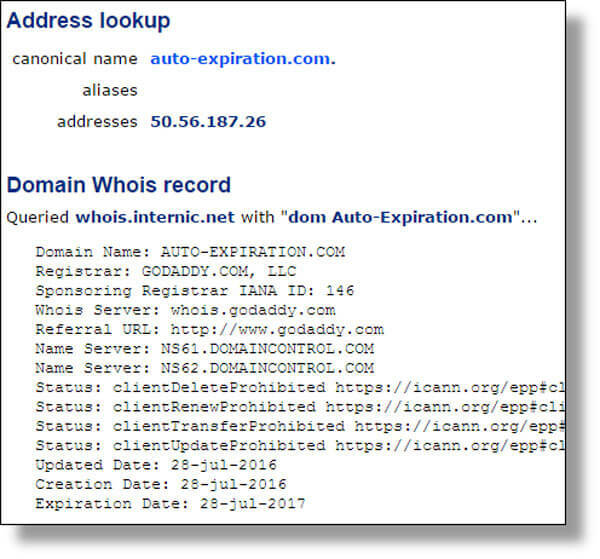 The screen shot of the domain name lookup above shows that the target web site was only created in July 2016, not even a year old at this point, and hardly what you would expect from an established brand. This does not give you a warm and fuzzy feeling at all, so the first company already fails our strict requirements for weeding out the wheat from the chafe with extended warranty companies. Here is the link to the Better Business Bureau report for this company. Further searches show other companies called 1st US Autoprotect, Autocare and Smart Autocare also using the same mailing address. And as added icing on the cake for those of you keeping score at home, just like the previous green letter I showed you earlier, this card indicated no Florida license to do business in our state, We could not find them in a search of the Florida Department of Financial Services database. Next we got this lovely pink postcard from a company called Protection Services with a phony mailing address of simply St. Charles, MO 63301. I guess if you speed read it too fast it looks like a real address. Protection Services doesn't even offer you P.O. Box for their return address! See scan of it at the top of this article. 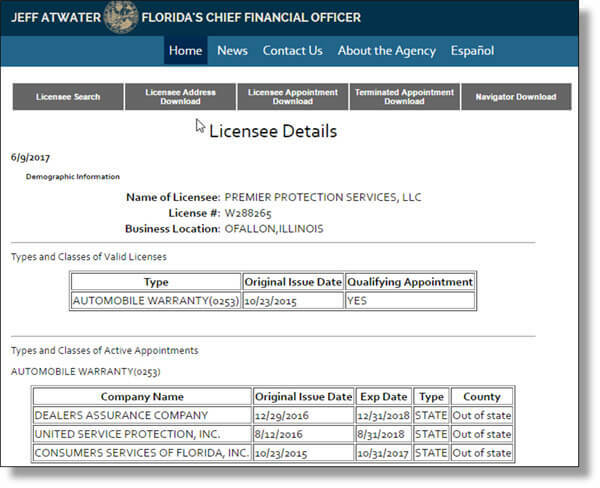 Florida Department of Financial Services lookup of license # shows several companies, not sure why all the confusing names. So a company claiming to be based in MO is telling Florida it is based out of O'Fallon, IL. Good luck figuring that one out. The pink postcard had a phone number of 800-919-8025, which as soon as you Google it you'll see hints of scam complaints about this company. Next we move on to search for any BBB complaints about them but the BBB shows no record of this company name in O'Fallon, IL or in St. Charles, MO. We have hit a dead end on this one. We cannot determine who these people really are, or what the real company name really is, what their real address is, and what the BBB record is because they left us such a dizzying array of smoke screens and different brand names. We have shown you how to root out potential scam warranty companies. What does the profile of an honest warranty company look like? Let's apply our same tight filter of scrutiny for example to CARCHEX, who is one of the major big brand warranty companies familiar to Internet car shoppers for over 15 years. How do companies like CARCHEX fit through our scam filters? First of all I completed our positive filter test on them inside of 2 minutes, unlike the half hour it can take with other companies as you trace out multiple names and addresses and then you come up empty handed. CARCHEX passes because they are a valid company who is not hiding behind smoke screens, every data point we look for on them is easily and quickly found as shown below. First lets take a look a CARCHEX. They have a web site called CARCHEX.com so there are no playing games with their name or who they are, and the web site matches their name. On their site you look at their Contact Us page and it shows their phone number that never changes, and it shows a real and valid mailing address of an actual bricks and mortar office building, not a PO Box at a UPS store. I can go to CARCHEX's products page and enter my information and immediately download a PDF file of the sample contract so I know all my rights before making a purchase. I look them up on the Better Business Bureau and see they have an A+ rating. I Google CARCHEX and there's tons of search results all associated with major sites, indicating quality links to a long established professional business with a secure site. You don't find that with the fly by night post card mailing companies. You Google the CARCHEX phone number and you get all sorts of search results mentioning them, not 10 different scamming companies and you'll find no complaints from any of those who called me sites. Even more effective vetting for the CARCHEX corporate offices, when we pull up Google Maps and look at the street view, you can see their sign with the logo on the top corner of the office suites where they are located in Baltimore, giving you visual confirmation that the company you expect to be doing business with is really there. See if any of the 3x5 postcard warranty scammers have any type of corporate office that you can verify in this manner. Now that CARCHEX has passed the test, the other major online seller of car warranties direct to car buyers is Warranty Direct. The result is just what you would expect from an established brand, and exactly as we saw with CARCHEX. This is how established brands should all check out. They do have a web site called WarrantyDirect.com, matching their company name, no smoke screens. Their Contact Us page shows their bricks and mortar mailing address and phone number which jives with Google maps, it is an office building. You can download the warranty contract off their web site to read before buying; no aggressive sales tactics trying to keep you from seeing it. If you Google their name, you see lots of references to them from quality sites and no fraud complaints. They also have an A+ rating with the Better Business Bureau, a difficult grade to achieve in this warranty space due to the high level of complaints that other lesser companies typically receive. Now you know how to determine which warranty companies are legit and which ones are scheming and scamming and using aggressive sales tactics, and refusing to take your name off the mailing list, and which companies are legit. 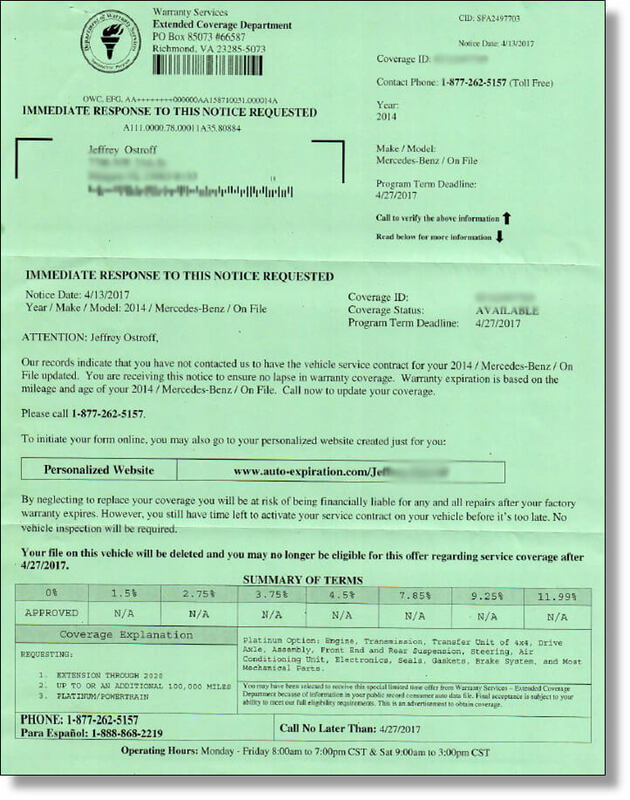 Have you been assaulted with onslaught of warranty solicitations? Let us know your experiences in the comments below.